We are super excited to have Jason Rockwood VeChain’s Country Manager in the U.S with us for an interview. Jason will be sharing how he believes the VeChain community can help raise awareness. What kind of CEO Sunny Lu is like! How JPMorgan’s new coin could be a positive thing for crypto. How his role as the primary contact in the U.S market is like. And of course will Jason crack under pressure when asked about future mainnet transactions? Jason how did you first get connected to VeChain? As a former Chief Information Officer, I was plugged into the types of technologies that large enterprises needed to run their business. I was at a big CIO event hosted by Gartner in October of 2017, and the keynote speaker was Don Tapscott. I left the event determined to better understand enterprise blockchain, and it led me to VeChain. VeChain was the first crypto/blockchain project I found that I could say as a CIO, “I would bring this company into my business.” The CEO is a former CIO. They had the support of DNVGL and PwC. I also liked the IOT component. My intuition was right, and our client adoption speaks volumes to VeChain’s credibility. When and how did you first get interested in cryptocurrencies? I purchased a huge amount of bitcoin all the way back at $10 each. I was a student at MIT in 2008 and 2009, so I was plugged into a community of early adopters. I remember buying issue number 1 of Bitcoin Magazine, going through the collapse of Mt. Gox, etc. I also dabbled in Blackcoin and Ripple when they were just hitting the market. As a deflationary asset, Bitcoin just made sense to me. Could you tell us more about your role at VeChain? I’m the primary point of contact for VeChain partners in North America. My job is to nurture relationships with enterprises, developers, development partners, and academic institutions. I also attend a lot of conferences to create visibility and awareness for VeChain overall. Lots of emails and phone calls, with a heavy dose of Twitter! Jason we have noticed that you’ve got quite the following over at VeChain’s subreddit page. What’s your relationship towards the community like? And what role could the community play in the future for VeChain? Honestly, my relationship with VeChain started a long time ago, in December 2017. I began like anyone else–in the telegram. I served as a volunteer admin for a while, and then started to realize that I could reach more people by being visible on Twitter and Reddit. The bear market was really hard on everyone, myself included. The community was an amazing resource to ride out the winter and keep the faith in the long-term vision. Now, as an official member of the team, I have to be more careful about what I share with the community. I can’t talk about price or partnerships, for example. The community overall has been very respectful and understanding of that transition. The best role the community has played (and will continue to play) is as a source of introductions to decision makers and developers. Our mission right now is outreach, and who better to support raising awareness of VeChain than the thousands of token holders working towards the blockchain revolution. What can you tell us about the VeChain team? They are some of the hardest working and smartest people I’ve ever worked with! VeChain is unique because of the professionalism of the team. Our team understands and fulfills on enterprise solutions. Very few projects in crypto have this understanding of the corporate market. Do you work closely with Sunny Lu? How is he like to work with? And what kind of CEO is he? Sunny is first and foremost a leader. 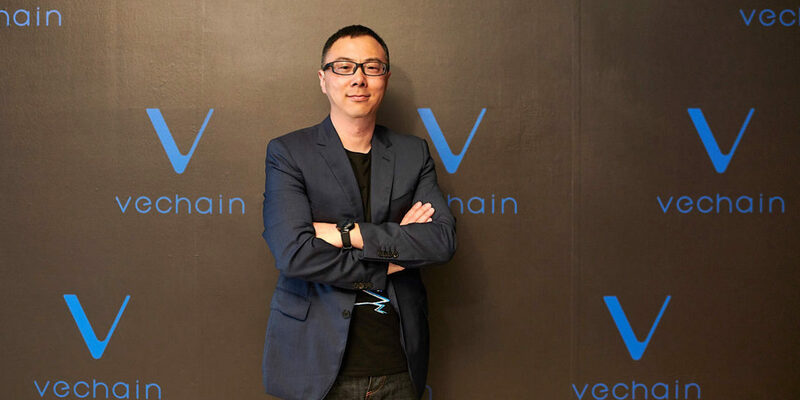 He has a clear vision of the future of VeChain, and he guides all of towards that goal one step at a time. He also believes in giving the team the space to create on their own–he’s not a micromanager. So obviously VeChain is a Chinese startup essentially, and with a strong presence in Asia. But with the help of the likes of DNV GL amongst others they have established themselves in Europe, and globally. How’s it been like ‘selling VeChain in’ towards the North American market? The American market maybe doesn’t know VeChain as well as in Europe and Asia (though it might), but there is still an immense amount of pent up demand for enterprise blockchain. Every large business is aware of it, experimenting with it, worried about it, etc. As we grow our network of development partners, the footprint of VeChain will certainly expand. In some ways, DNVGL is the sort of “Platonic Ideal” of what a partnership looks like. Their contributions to the VeChain Ecosystem can’t be overstated. But what would it look like for a 20 person development shop in Nashville to use VeChain in a similar way? Why do you think large enterprises would rather go for the blockchain solutions of a company like VeChain, preferred to an established global company like IBM? Business use case should always drive decisions in vendor procurement and technology roadmaps. Certain businesses have challenges that are better solved by one company or another, one solution or another. I have a lot of respect for IBM and everything they are doing to grow the market for enterprise blockchain. How does the process look like for attracting new clients and partners? Do you get contacted by the clients themselves? Are you establishing first contact? Or is it happening a lot via your current connections? Clients interested in working with VeChain in the United States can reach me in a variety of ways. Sometimes a community member makes an introduction. Or they email me at BD@Vechain.com and then get forwarded to me. Other times a potential client will contact me directly via Reddit, Twitter, or Telegram. Sunny Lu recently released tidbit about cross-chain protocol being on the way. Could you give us any interesting examples of how VeChain could work together with other blockchains in the future? I’m going to pull a Sarah Huckabee Sanders and just say, “The Tweets speak for themselves” (referring to the White House’s oft-used explanation for the president’s tweets). What’s your take on the new JPMorgan coin – JPM Coin? And the news that Facebook is launching a ‘cryptocurrency’? I think that enterprise adoption of cryptocurrency is a positive indicator of market maturation. It’s obvious for anyone that there’s a lot tribalism going on across crypto forums. And communities can sometimes be hostile against each other. Does this only exist on forums like Reddit? What can you tell us about meeting up with other crypto projects outside of the internet? In my experience, the hostility from altcoin tribes dissipates when meeting in real life; the hostility from bitcoiners intensifies in real life. What’s been your biggest challenge when trying to onboard large enterprises? Or even provide use cases for them? When working with enterprise clients there are three stages: first, does the enterprise understand the value of blockchain for their business generally? If not, you have to start there. Second, when they understand blockchain, I can easily educate them about VeChain and why we are a smart alternative to Ethereum or permission/private chains. Third, we can explore use cases together. The challenge is that those three steps can take a long time. It’s rare to find a business that wants to (and can) move quickly. What’s your thoughts on crypto regulations? And how do you think regulations could potentially benefit VeChain? Regulations will undoubtedly become clearer in the next 12 months. I think we will see smaller nations like Cyprus and San Marino move more aggressively to adopt crypto-friendly legislation than nations like the US, but I could be wrong. It’s really anyone’s guess right now. What’s the main difference when you meet clients today to talk about blockchain solutions? Compared to maybe a year ago? Crypto Winter has been a good thing for adoption. The bull run was bad for business–it was very distracting and left many executives skeptical. Now, the companies that are interested in speaking to us are doing it for the long-term, they are serious about the true technology transformation that blockchain makes possible. Out of all the official projects and partnerships, which one excites you the most? That’s like asking a father which child is his favorite! Of course they all are. The million dollar question that the community asks daily. When can we expect transactions on the mainnet to really ramp up? Much like partnerships and price, I’m not at liberty to present forward looking statements of network usage and adoption. What can you tell us about the VeChain summit 2019? Any sneak peeks you could share with us today? The VeChain Summit (Creating Valuable TXs – April 18, 2019 in San Francisco) is going to be an incredible event. It’s unfortunate that the bear market will prevent many community members from attending, as I think any token holder will be blown away by the demonstrations of the technology. It’s going to be a truly interactive event, almost like building your own blockchain supply chain use case. For anyone serious about helping with business adoption and onboarding, it’s a must-attend conference. Anything else that you could share with us? I’d just like to reiterate how important the VeChain Summit is going to be. Do all you can to make it there. I think it will be a special time in VeChain’s history. In some ways, it’s a coming out party for the US market, and that alone will make it memorable. Hope to see everyone there! Big thanks to Jason for taking time to answer our questions, we wish him and VeChain best of luck. No doubt they will help to improve blockchain adoption over time! And of course do follow Jason on Twitter and show your support.